Ecofab has been very busy in expanding it's business throughout several countries including the United States, Canada, Australia, Africa and the Middle East. This expansion has led us to increasing our research and development (R&D) department. Our R&D team have successfully developed some new custom wagon cover systems to suit our ever growing clients requirements. We are having ongoing success in providing automatic and semi-automatic wagon covers to ex-coal hopper wagons to enable these wagons to haul agricultural products. This has been a cost effective solution to the industry especially with the downturn in coal markets resulting in surplus redundant coal wagons. We have undertaken a number of aerodynamic studies with NASA, the University of British Columbia and aerodynamic engineering consultants. These studies have been aimed at reducing train aerodynamics which leads to improved fuel efficiencies. This is a field of great interest to all our existing and new clients. In the past with lower fuel prices, railways were not that interested in fuel reduction technologies. There has been a generational change and we have found that railways are now heavily focused on reducing fuel costs. We have a number of clients that have reported they use approximately the same amount of fuel if they are hauling either a loaded or empty freight train on similar terrain at similar speeds. Fuel costs are generally the second highest expense to railways, second only to labour costs. Consequently there are determined efforts throughout the railways to reduced fuel costs using new technologies. Ecofab wagon covers can reduce aerodynamic drag on an open top freight train (travelling at 80km/hr on level terrain) by up to 43%. This drag reduction produces significant fuel savings. We are also working on further drag reduction technology for freight trains that will provide increased fuel efficiencies, a critical factor going forward with ever increasing fuels costs. The fuel savings we generate also provide another benefit that has not normally been considered within the railway industry, and that is reduced CO2 emissions. Nearly all railways now have a strong corporate message about reducing CO2 emissions. The environmental departments within railways are actively engaged in a host of programmes aimed at reducing these emissions. There is a direct correlation between fuel consumption and CO2 emissions, our wagon covers provide an immediate benefit in both these areas. Since commencing our business over 40 years ago covering wood chip wagons, we have seen an expanding market where we are now covering a diverse range of commodities. These vary from the agricultural and mining industries to contaminated wastes including radioactive materials. Environmental groups and the community are actively lobbying governments to demand industries accept their environmental responsibilities. These lobbying efforts are now being reinforced by litigation in many jurisdictions throughout the world. Ecofab can not only assist industries in meeting their environmental responsibilities but provide a host of other operational benefits to its customers. 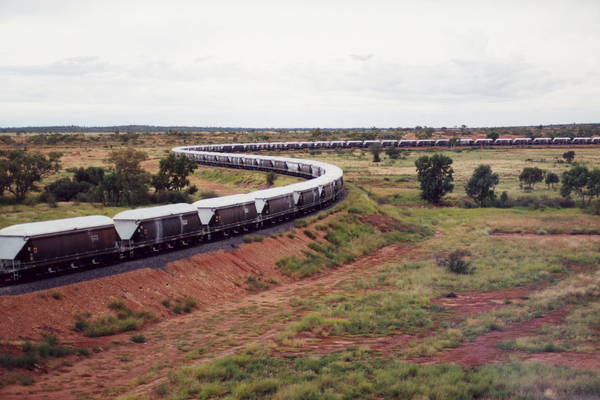 Ecofab is a world leader in covering rail hauled bulk commodities.